You would be surprised at just how much you can save if you get your timing right. 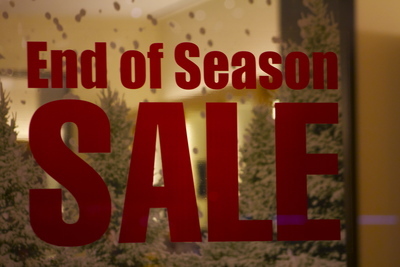 Most items go on sale at a certain time of year, mainly at the end of season. End of season clearances usually coincide with sales of last-year models just before this year’s models are about to arrive. There are also teaser sales that are aimed at raising consumer interest before just launching a new product. With some research and strategy, you can get great deals on mostly anything. Here is our end of season shopping guide. August and September are best times to buy last year models of cars at 15% discounts since new models are often released in the fall. To find out which cars have been redesigned for this year, check out the free online New Car Preview. The changes and updates are sometimes merely cosmetic so you will get a good deal. Sometimes it is possible to save up to $4,000 on the last year’s model without any disadvantages. Vacation at the end of September or in early October if you can, that is when the prices drop considerably, from hotels, airfares, theme parks, to luggage and beach accessories. You can get a Hawaii holiday up to 40% off, as well as hotels in the Mediterranean, and deals for October travel are possible for Aruba and other places in the Caribbean. However, cruise prices don’t go down at the end of summer, and you might want to wait until January to get the best cruise offers. Most stores have end of season clearances on clothes. You will find great deals on winter clothes just after Christmas, though retailers will have first discounts on coats, hats and sweaters around Labor Day. As this year’s trends might not be in for next season, try to look for pieces that are timeless and can combine easily with lots of stuff. August and early September are best for summer clothes sales, all shorts and short sleeves will definitely be discounted. Check back-to-school deals for school clothes, sneakers, blue jeans, khakis, white shirts, socks, and underwear. You can also browse your favorite discount retailers and get good quality swimwear online with zero effort. Back-to-school discounts in August and even early September are best for getting school necessities, stationery, and office supplies, everything from paper, notebooks, pens, backpacks to glue and binders. You can check discount stores and supermarkets for good deals and you might get a 10-piece package of pens for less than 50 cents. Back-to-school is also the best time to buy computers, cell-phones and other electronics at up to 30-50% discounts since new models are expected to come out in early fall. This also goes for coffeemakers and microwaves, anything that a college student uses basically. However, new gaming systems are released for winter holidays, so you might want to wait with those. As September is especially stressful with the start of the new school year, moms have a greater need for spa treatments and some relaxation. That is why facials and massages are dropping down in prices in August and September in many spa centers, up to 50%, so why not take a well-deserved day out and go pamper yourself?